Haselor parish is set close to the River Alne and includes Upton, Haselor and Walcot. The three villages are in a Conservation Area with many notable cottages and houses, and the whole area is visually very attractive. As you walk through Upton look out for the farmhouse of Manor Farm which is Grade 2 Listed and dates back to the 16th century. Haselor since Saxon times was divided into two Manors; Haselor and Upton. Both Manors had various owners, but the most significant were St. Mary’s College, Warwick, who held the manorial rights from 1395 to the 1530’s. They were followed by the Grevilles of Beauchamp Court and Warwick Castle. The 12th century parish church was founded by Henry 1 (1100-1135) and is dedicated to St. Mary and All Saints. The church was also held by St. Mary’s College of Warwick from 1394 until Henry VIII when the Crown took over. One notorious incumbent was Reverend Cornelius Grieffin, a one time inhabitant of the debtor’s prison in Warwick and slept at the church in a coffin. Inside the church, there are two plaques that commemorate the members of the parish who died in the First and Second World Wars. The Grade 2 Listed St. Mary and All Saints Church, set high above the village is only accessible by the footpath or bridleway. The churchyard has stunning views over the surrounding fields and meadows of the Alne valley. Notable properties in Haselor include Upton House, a three storey property set high up from the road and the old Grade 2 Listed Post Office cottage with the George VI post-box. The village stocks are to be found at the start of the footpath climb up to the church. Further along the main road on the left, is the site of the old village public house called The Crown Inn, but which has been redeveloped into Crown House and other properties. Tudor Grange, the Haselor Primary School opened in 1877 and has been extended to enable it to grow and flourish. At the bottom of the village on the right, near to the crossroads, is the old Baptist Chapel and now converted into a private house. There are three floors in the property, and the bottom floor still has the old font in it and there are candlestick holders everywhere. The stones with dates and names on are still in the walls. 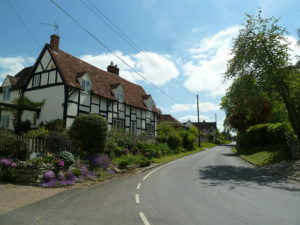 Walcote has a very picture postcard collection of houses and cottages. Look out for Walcote Farm, Paul Pry Cottage and the Victorian Old Vicarage. One particularly interesting property as you walk through Walcote is the Old Cider Mill House with the old cider press outside. The earliest mention of the Cider Mill (spelt Cyder Mill) and the house date back to 1812. It was last used in 1947. Walcote Manor Farm is a Grade 2 Listed Building and is on the right as you leave the road to take the footpath heading towards Withycombe Wood. 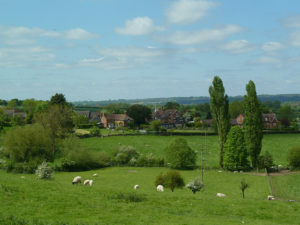 Aston Cantlow stands amid the lanes of the Alne Valley, with the Alne Hills nearby and the village comprises some fine old buildings nestling around a small green. The village is very old, an Anglo-Saxon burial ground having been found there, as well as being mentioned in the Doomsday Book of 1086. From this we learn that the pre-conquest owner was Earl Alfgar, son of Leofric, Earl of Mercia. The mention of a priest also means that there must have been a church in the village in Anglo-Saxon times. The two words which make up the name of the village were coined at different times in its history. ‘Aston’ is a common place name which developed from a word in Old English meaning ‘the eastern settlement’ and was certainly in use before the 11th century. The ‘Cantlow’ was added in the 13th century when the Manor of Aston came into the hands of the Cantilupe Family in 1205, when it was granted from King John. It was the home of Mary Arden, Shakespeare’s mother. The Grade 1 Listed parish church of St. John the Baptist preserves many antique features despite restoration by Butterfield in 1850. The church is principally in the Early English Style and the north aisle and chancel have good Decorated Tracery. One notable feature inside the church is to see that the south wall of the chancel leans dramatically inside. There is an attractive 15th century font, some old woodwork, fragments of 14th century glass and Victorian windows. Over the north doorway is a representation of the Nativity. It is believed that Shakespeare’s parents, John Shakespeare and Mary Arden were married at Aston Cantlow in 1557. The churchyard at St. John the Baptist contains many old tombstones, old Yew trees, and old Pines. In the vicinity of the church there are many interesting properties. At the south side of the churchyard is the Grade 2 Listed Old School and Master’s House (now a private house) and next to the lych-gate is the Old Post Office. The Old Vicarage is in Church Lane and Manor Farm shows traces of 17th century work. Almost opposite the end of Church Lane is the magnificent black and white half-timbered, early 16th century Guild House, which boasts close-studded walls and a jettied upper floor, and is now used as the Village Hall. The Guild House is traditionally believed to have been the Hall of the Guild that was in existence in the time of Henry VI. It is first so called in a lease of 1713 and as late as 1770 the upper chamber was reserved for Manorial Courts, when Aston Cantlow was the centre of the parish which included Wilmcote, Sheffield, Newnham and Little Alne. The building preserves externally much of its original appearance. The rear of the building was extended in 1961. Two notable buildings along Bearley Road are The Old Forge and The Old Bakery, both of which are now private houses. Aston Cantlow has one public house and one club. The Kings Head is a traditional 15th century public house and restaurant which is a Listed Building with original oak beams and open fires. It is rumoured that the parents of William Shakespeare held their Wedding Breakfast in the Kings Head. barely read or write. Today, it is a modern club with all the usual facilities and is open to all visitors to the village. The now dismantled branch line of the Great Western Railway from Bearley to Alcester, which was opened in 1876, ran through the village and for most of its length followed a line between the centre of the village and the River Alne. The line went as far as Great Alne Station and a halt was built in 1923 for Aston Cantlow and can be found approx. half a mile outside the village on the Bearley Road. Many visitors come to the village in the summer months to stay at the Island Meadows Caravan Park (which hosts the only shop in the village between March to October). Car parking is available at the side of the Guild Hall and there is more behind it adjacent to the tennis courts and the playground. Great Alne takes its name from the nearby River Alne. It was first mentioned in the charter of King Ethelbald (723-737) as a settlement being near to the river and which our ancestors used to call ‘Alwine’. The Celtic word ‘Alwine’ means bright and clear. Most of the village east of the Memorial Hall is formally designated as a Conservation Area. Great Alne and Kinwarton Memorial Village Hall was built to commemorate the part played in the Great War by the men and women from the two villages. Two Oak plaques listing the fallen and those who had served in both the First and Second World Wars can be found inside the Hall. Work started on the hall and the foundation stone was laid on Sunday 7th November 1920 by W. L. Chance J.P. and the trowel used is now on permanent display at the Hall. The Hall was formally opened on 23rd October 1921 by Sir Ernest Pollock, the 1st Viscount Harworth, M P for Warwick and Leamington, and the Solicitor General in David Lloyd George’s Conservative Government. There is a Jubilee Oak tree celebrating the Golden Jubilee of Queen Elizabeth 2, planted in October 2012, in front of the Memorial Hall. The parish church is dedicated to St. Mary Magdalene, and is situated in a lovely setting at the end of a footpath, leading off the main road (B4089) that runs through the village. Its location means that the churchyard is a popular resting point for walkers on their rambles. St. Mary Magdalene Church has an interesting west porch, which is carried on up as a square bell-turret and then changing to an octagon at the top, and having an octagonal pyramidal roof. There is one bell of 1670. The stained glass in the east window dates from 1860 and depicts biblical scenes from the life of Mary Magdalene. The font, of flower pot shape, may be an old one re-tooled and it has a shallow bowl. Although the church is 13th century in origin there has been later additions. Inside the church, there is a wooden war memorial to the memory of those men of the parish who gave their lives in the 1st and 2nd World Wars, which interestingly contains the name of a woman Sister E M Elvins. Great Alne Hall in The Park was built in a mock Tudor style by Daniel Ratcliffe in 1876. He also built the Lodges at each entrance. The Hall was demolished in the early 1940’s when the Maudsley Motor Company moved to Great Alne from Coventry. Following the closure of the factory the site has been redeveloped as the Maudsley Park Retirement Village. The only evidence of this period of Great Alne Hall can be seen in the still standing Lodge House in Park Lane. There is a Jubilee Oak tree planted on the small triangle of ground in front of this Lodge House, and it was planted to celebrate the Golden Jubilee of Queen Victoria in 1887. The present school in the village is the Great Alne Primary School at Alne End. Around 1836, the first school room for the village was attached to the Church. The Old School House and Former School which is almost opposite the present one, was built in 1839 and is a Victorian Grade 2 Listed Building. It was not vacated until the present school was built in 1965. After that date the Old School was used by Warwickshire County Council as a pupil Referral Unit, until it was sold. It is now a house and still has the inscription ‘National School built 1840’ visible. National Schools were created in 1811 by the Church of England. 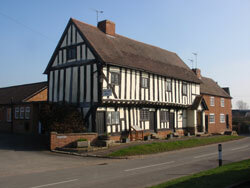 The public house at Great Alne was until recently called The Mother Huff Cap and with its unique sign and name was mentioned as far back as 1675 as one of the six prime post ways on the London to Shrewsbury Road. The name comes from a 16th century term for a strong ale which would ‘huf one’s cap’ or make the drinkers head swell. The Mother is likely to be the woman who brewed the beer and managed the pub. The building under various ownerships suffered from general decline over the years and in 2009 it was sold to a managed pub operator who was prepared to invest in it. They changed the name to Huff Cap. The former Great Alne Railway Station and House can be found on the corner of Pelham Lane and Henley Road, almost opposite the Great Alne and Kinwarton Village Memorial Hall. It was the only intermediate station on the Great Western Branch Line from Bearley to Alcester. The line closed completely in 1951, at which time the station then became the village Post Office, until it was sold. It is now a private residence and the old station house is maintained in the original GWR colours with the platform terrace canopy still supported by iron brackets bearing the stylised initials of the Alcester Railway. Next to the Old Railway Station is an area of woodland which was bought by the residents of the village in the 1990’s and given to the Woodland Trust to manage. The wood was named after a small steam engine that ran through Great Alne and was affectionately known as the ‘Coffee Pot’. It was the children at the Primary School who gave the wood its name. There are a few car parking spaces by the Church and more at the Memorial Village Hall.